My answer here is entirely subjective because I have never cut my hair into a TWA. I do however think you are right to attribute some of the knotting to not detangling but I also think the daily washing may also be a factor. Why is detangling important? Getting rid of hair that has shed prevents it from becoming trapped within the other hair. Depending on your level of skill, you can detangle hair dry or wet. Most people find it easiest to detangle when hair is wet and soaked with conditoner. 1. Experiment until you find a conditioner that gives you slip, meaning your hair feels very slippery when coated. So many people avoid silicone containing conditioners but these are really really excellent for creating slip. If you are a silicone avoider, just find an alternative which has slip. 3. My top tip - work section wise. Imagine your head in 4 or 6 sections and apply conditioner on one section at a time. Using a shower comb, gently comb from tip to root. 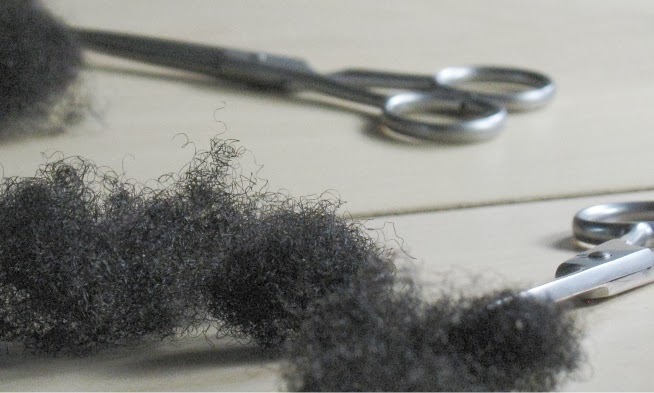 Always rinse out any shed hair from the comb before going back over the section and add more conditioner if you get to a particularly stubborn point. You can also just use your fingers which is sometimes much easier, but the rule still remains, you need to rinse off your hands multiple times to get rid of the shed hair and reload conditioner when you reach a stubborn point. I would say do not be scared of shedding. Remember you can be losing as much as 180 individual hairs each day (see this link) As long as you are not physically feeling any pain, then you are not pulling your hair out. Trapped shed hair can lead to matting eventually so get rid of it. Should you really wash your hair every day? You may also find that perhaps washing your hair every day may be contributing to the tangling. Essentially type 4 hair seems to thrive when not manipulated often. Perhaps washing every other day or once a week may help too. Do you have tips for Noella? These tips are right on point!! I hope you don't mind, but I am sharing this post with my followers today, because this is something that I too struggled with in the beginning of my natural hair journey. Your #2 tip is definitely on point. My favorite cheap conditioners are V05 Freesia and Blackberry. They have great great slip and don't cost (or you shouldn't pay) over $1.00 for them! Thanks L.Michelle - sure go for it! I've added ceramides and a porosity control product to my regimen and my hair stays moisturized. Your hair sounds like it surrenders moisture to easily I highly recommend a porosity control product. I use Roux porosity control conditioner. Next, find a product with ceramide or add them to you products. You can find ceramides in wheat germ oil, walnut oil, and sunflower oil. Thanks Jc, I'll try these amazing tips today! I just get worried over the amount of hair I see on my shirt, the floor, the bathroom sink, etc, when I attempt to detangle. My hair is short so I just wonder if my hair is damaged or if I'm doing the wrong thing. But thanks a bunch for the tips! Thanks for all the additional tips! Thanks for contributing to the blog Noella! Jc - You basically read my mind on a daily basis! I was just pondering if I was washing too much. I have shoulder length hair but since I have fine strands, I end up washing 2-3 times a week to get "the fullness" back. I'm going to start bunning more and try to only wash 1x/week. Also, can you please shed some light on Addy's comment about ceramides? Are ceramides really found in the natural oils she mentioned? I have been trying to research this on my own, but no luck so far. Ceramides are based on natural oils found in the cuticle (yes IN BETWEEN the cuticle layers). They were researched for relaxed hair rather than natural hair because relaxers can dissolve the oil in between those layers. Ceramides also perform a "barrier function" and help reduce the hair's overall porosity. Ceramides bind to the hair fiber in damaged, vulnerable areas to help prevent natural moisture and protein loss that occurs when we manipulate our hair. Less porosity equals more moisture. More moisture equal less knots & tangles. Less knots & tangles more length retention. Oh yeah, ceramides can also be found in hemp oil and kukui oil. Ceramides help keep in moisture and protein longer but they're no substitute for a protein/moisture regimen. You still need them just not as much. There are many other lines that contain ceramides, so be on the lookout. I read that post and you also mentioned ceramides in your ingredients guide briefly I think. I'd like to add ceramides to my regimen (even though I'm not relaxed). So, should I buy some wheat germ oil? Or do I have to just find hair products that list ceramide in the top 5? wheat germ oil added to my DC left my natural type 4 a hot dry mess. I saw no benefits but was hoping for smoother cuticles. JC - Have you done a post on banding? I wanted to know if it was damaging to hair to wash, condition and air dry in bands. I've found it's the easiest method for dealing with my hair and making it easier to cleanse the scalp than in braids or twists. It also stretches my hair but though I use ouchless bands, I wonder if this will cause friction/breakage in the long run? Thanks for your replies. Not sure how to make my question more clear. I am looking for evidence that ceramides are contained in natural oils. I have not seen anything supporting that idea. Maybe this is a question that cannot be answered. Also, I looked up some of the products Addy mentioned and cermaides are in the very bottom of the list, if at all. That's assuming the online ingredients lists were correct. No offense intended Addy, just trying to get to the bottom of this. The ceramides are usually near the end. Most products have a 1-2% concentration of them. When you look at all of the lines that have ceramides, the position is usually close to the end with the exception of those "salon" ceramide treatment things. Ceramides, with regular use, can help build an extra layer of protection for your hair. Been researching this for a while. I wish I could show you all the links. But google "ceramide r" you should see a link from l'oreal. Maybe JC can do a series on the oils! This is what I got from kiehl's website. I was reading up on their "SUNFLOWER COLOR PRESERVING CONDITIONER" Might try some of this for the ceramides alone. BTW, ceramides are also found and eucalyptus. Did you try googling "sunflower oil" and "ceramides" in the same sentence? That's all I do. **Major Update** I tried the amazing tips you gave me and (drum roll please)..... IT WORKED!! It took forever to detangle but, I got through it. There was quite a few shedded hairs but nothing to fret over, but so far so good. Thanks so much Jc! Addy and Little One - I will make a quick post vis a vis ceramides and the scientific papers on them. It also helps to get a trim every once in a while too. I used to have a twa and I found that split ends were the cause of my fairy knots. So yes, detangling is very important as well as that occasional trim. Another tip is too keep your hair moisturised and used a head tie at nights.